There’s something so trendy about long cozy cardigans that have us jumping for joy, and the same goes for this #alldaycardigan. It’s like wearing a socially acceptable and fashionable housecoat all day long. This cardigan is worked flat for the entire body until you reach the armpits. From there it’s split into three sections (left front panel, middle back, and right front panel). Once finished the body you will use the three needle bind off to seam up the shoulders and essentially create a very long vest. 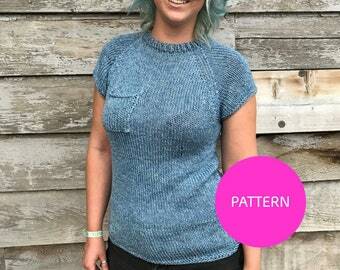 The remainder of the pattern consists of picking up the stitches to work down the sleeves. 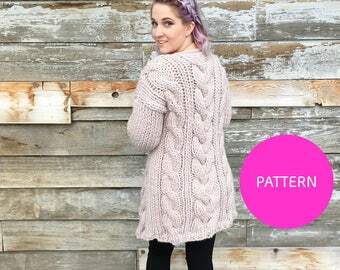 This pattern is written in two sizes with the (M/L) size in brackets and in red. It is suggested to highlight your size so you know which stitch count to follow. Model pictured is wearing the M/L size. 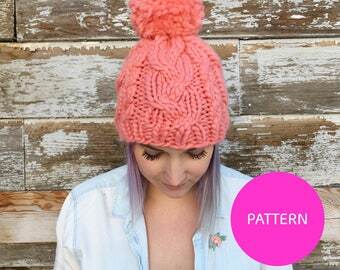 You will need to know how to cast on, knit, purl, increase, decrease, pick up stitches, knit in the round, cast off and seam. 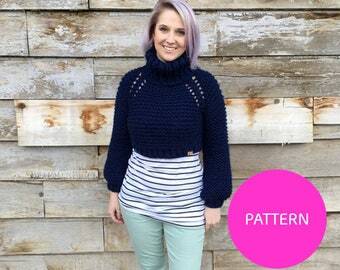 Once payment is received, you will receive an email containing a download link button for the PDF pattern. 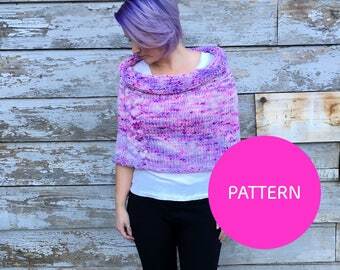 Make sure you have a PDF reader installed to open the pattern. 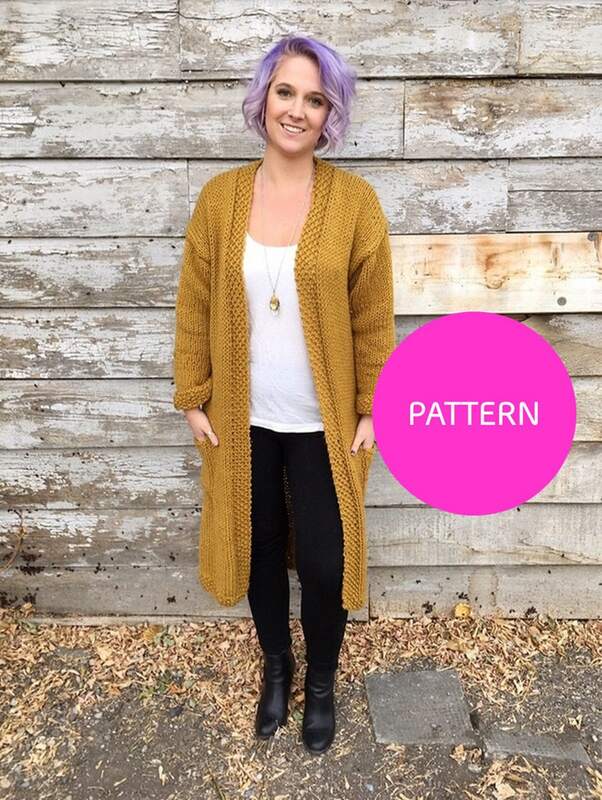 All Day Cardigans created using this pattern may be sold in small quantities (less than 10 total) with written consent first given by Chantal Miyagishima of Knitatude. Credit must be given to Knitatude / knitatude.etsy.com. Pattern and photos can not be used for resale purposes. 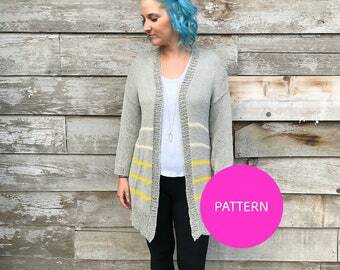 Please share your work with the hashtag #alldaycardigan and #knitatudeknits to share the handmade love! Notice: All rights reserved. If selling the finished product, you must first get written consent from Knitatude and credit must be given to Chantal Miyagishima of Knitatude as the designer. Rewriting, reselling, distributing, or copying the pattern is prohibited. Thank you for your understanding and cooperation. I accept PayPal, credit card and Etsy gift cards. All orders must be paid in full before I will ship. All items are non refundable! *Please note that unless stated "READY TO SHIP" on a listing, all items take roughly 7-10 business days to make and prepare before shipping. Sadly we do not offer any refunds or returns once the item has been delivered. Due to our products being made by hand and made from delicate materials we are not able to give refunds. The only exception would be if there has been a extreme situation in which the buyer is responsible for return shipping within 5 business days from receiving parcel. I try my hardest to get items out as fast as I can make them. Depending on how busy I am especially with fall and Christmas season some items can take up to 2-3 weeks to produce. You can always convo me prior to placing an order to get an estimated completion time frame.